Events and people help make it all happen. From our annual fundraiser Kiteboard 4 Cancer to small dinners and events put on my Project Koru advocates and alumni, individual support drives the great work we do! If you're interested in putting on an event for Project Koru, reach out! No experience is necessary, just passion and effort! We even have all the tools to make it easy for you to do on your own! 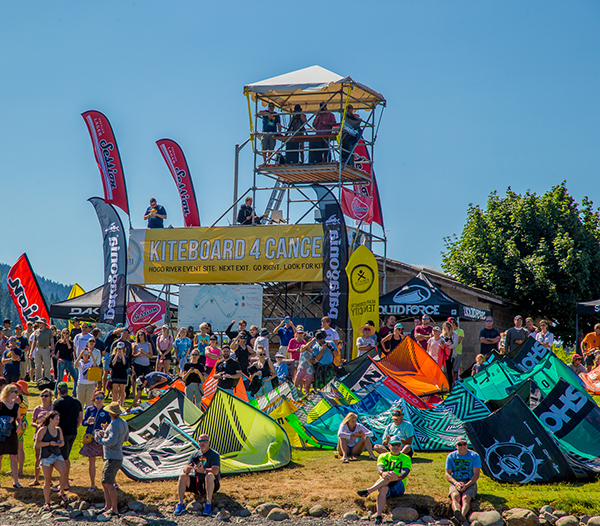 Kiteboard 4 Cancer (KB4C) is our annual fundraiser in Hood River, Oregon. It is a festival for all that celebrates life through the healing powers of facing challenge in the elements, benefiting a cause that affects all of us. The main event is a 6-hour Kite Derby race in the mighty Columbia River that challenges men & women physically and mentally, designed to embody the battle that someone facing cancer endures every day. You don't need to be a kiteboarder to appreciate it. It's absolutely a blast to watch from the shore! Anyone can attend or fundraise for Kiteboard 4 Cancer! 2019 Fundraising & Registration opens April 1, 2019. John Crane is one energetic and upbeat weight lifter from Cheshire, Mass! He came to us excited about our mission and eager to help. John's idea to fundraise for Project Koru came in the form of deadlifting, of course! So, with a little help from our fundraising platform to make it super easy for people to donate, he launched his own campaign to inspire "lifters" to deadlift as many time as possible within 24 hours to benefit Project Koru. Every rep executed increases funding for Project Koru by $5. So cool! Want to take part? You still can! ALIVE 365 - 365 DAYS A YEAR! A cancer survivor's "survivorship" day packs a punch of emotion. It could be the anniversary of the day they were diagnosed. It could be the day doctors told them they were "cancer free." For a dear family member or friend, it could be the day their loved one was lost or won their battle. Through Alive365!, you pick a challenge--anything you want--and see it through right up to your day or the survivorship day of someone you want to honor. Along the way, you'll rally your family and friends to support your efforts to send another young cancer survivor to Camp Koru. Start here! Don't see a fundraiser you want to join? Make your own here! Get creative!